The salting of the monkfish is so perfect I imagine the fish was born already salted. I definitely think this is something. I’m excited. 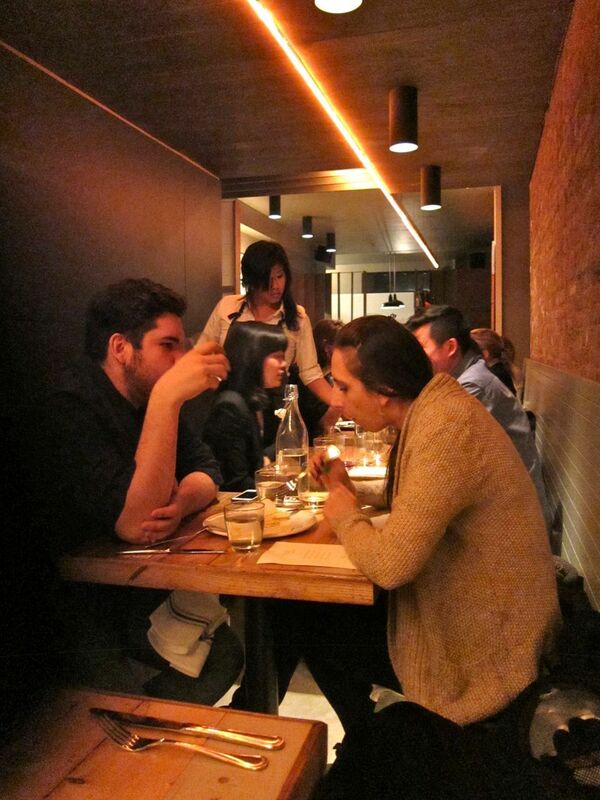 I’ve only had one dinner at Contra but for me…many gasps, deep sighs, cries of…amazing. In 45 years for me now as a restaurant critic, good is often good. Glorious is not that often. It’s like finding an oil well in your backyard, or a diamond worthy of Elizabeth Taylor in your late grandma’s handkerchief box. 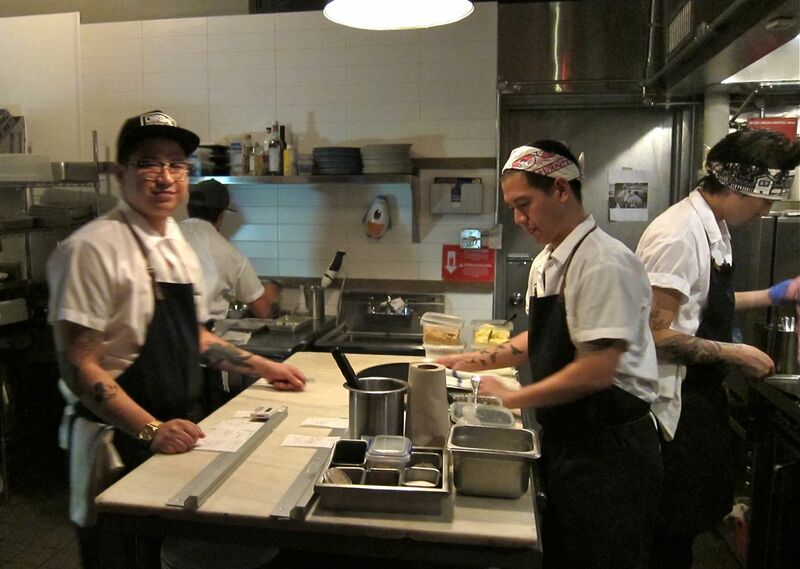 Orchard Street digs are meant to counter traditional fine dining ambiance. 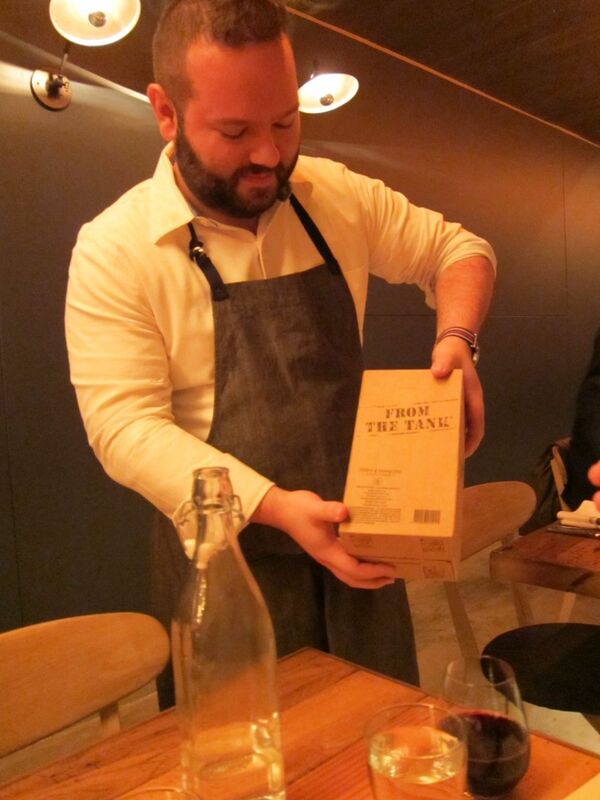 The waiter pours Estézargues “From the Tank,”a Rhone red, from the cardboard box. Agreed. A modest entry, unassuming room, bare brick, navy wallboard, a stretch of neon tubing overhead, just 44 seats at scarred wood tables. “Recycled,” “Salvaged,” “Repurposed.” The three of us play with the cliché of contemporary virtue. The evening begins lamely, with the woman at the door suggesting the three of us might somehow spend an evening at a tiny two top. “Not if we all have knees,” I grump. She looks at me – sommelier Linda Milagros Violago, I later learn -- and reconsiders, shoving two tables together. “I know you from somewhere,” she says. Crusty rolls with a chewy interior, painted with lard: a good omen. There’s only one beer – Resin in a can, by chance, a favorite of son Nico. The waiter recommends Estézargues, a Rhone “from the tank,” one of three reds on the skimpy, or shall I say, focused, by-the-glass list. He pours it from the box for Lauren. I see that the menu asks $3 for bread. I’m annoyed that a $55 tasting doesn’t include bread. “I guess we’ll take $6 worth of bread,” I decide. A wise move as the kitchen seems a little slow. Big, dark brown rounds arrive, already broken into halves, not very attractively, “brushed with lard,” and alongside “just everyday butter,” the waiter responds when we ask. 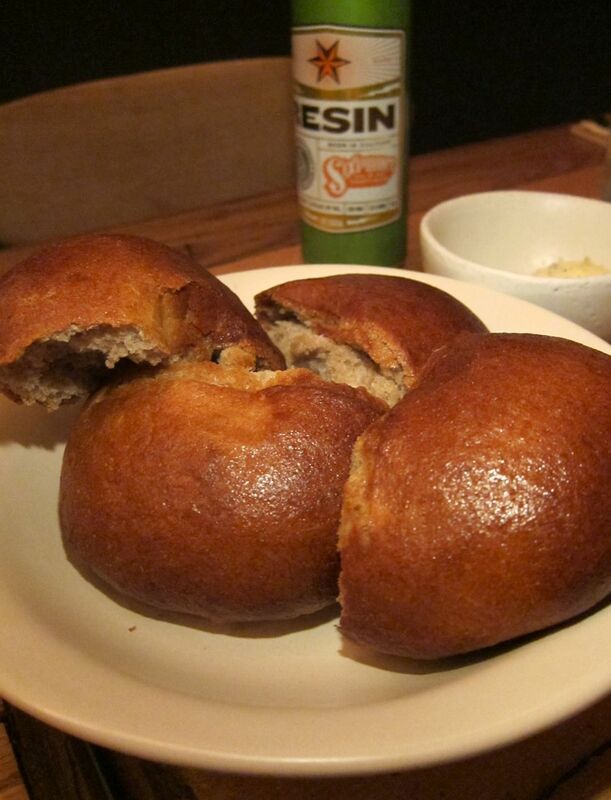 The crusty warm rolls are unusual, seriously seductive. Good bread always gives one hope. These mostly whole wheat rounds signal more than mere hope. I’m not going to crave this kohlrabi creation the rest of my life but I’m impressed. 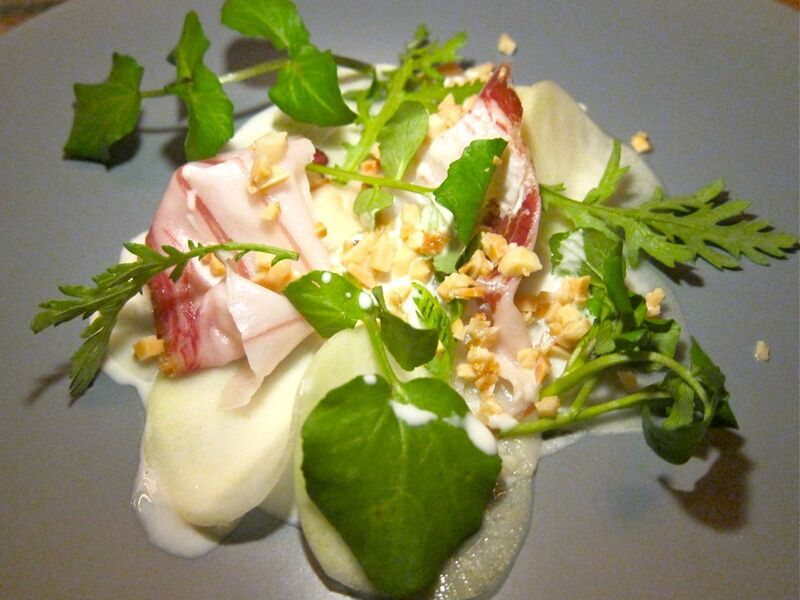 Layers of pancetta, chrysanthemum leaves and wild watercress top lightly pickled kohlrabi crisps as a starter. The vinegar and verjus bath begins when you settle at your table, it seems. Almond milk softens the acid tickle. It’s original and delicious, the kind of very personal food the chefs have said they want to do. A pause in the kitchen's evening marathon. Chef Fabian von Hauske is just 23 but he’s worked at Noma and Fäviken, Magnus Nilsson’s place on top of a mountain in a remote corner of Sweden. He and chef Jeremy Stone met at the French Culinary Institute when von Hauske was a student and Stone worked in special events. Stone had spent a few years in Paris and Normandy, then came back to Omnivore and Isa. Afterward, the two traveled together, working, moving between hemispheres, talking about doing a restaurant together since 2010. In an interview with Eater, they told of looking at 70 spaces and meeting resistance as unknowns from unimpressed landlords. It’s Contra, in contrast to traditional fine dining places, according to Stone, and reflects the two chefs going back and forth each evening after dinner, deciding the menu. “We want to be serious but not take ourselves seriously,” Stone said. "You should know you’re on Orchard Street. When you have dinner here, whether you're a tourist visiting or someone from the city, you should feel like you can't get it anywhere else." 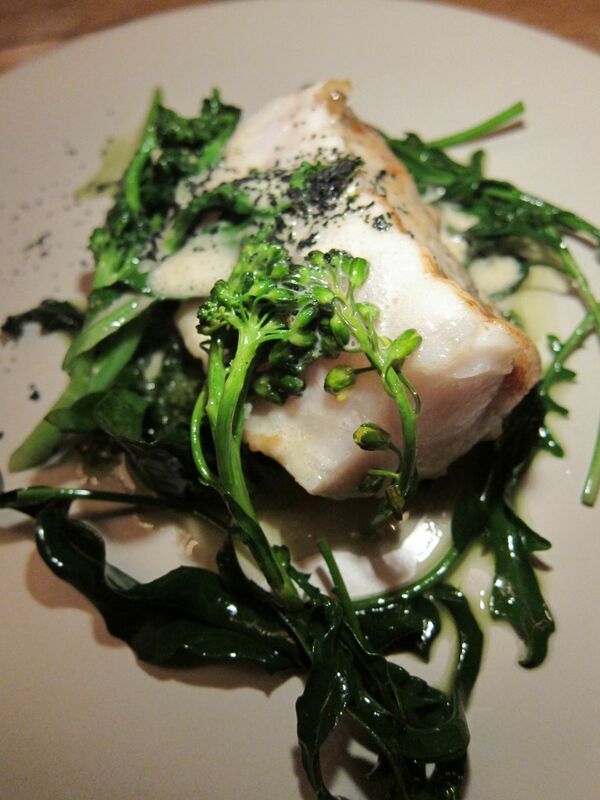 The perfection of tonight’s monkfish evokes memories of early days at Le Bernardin. 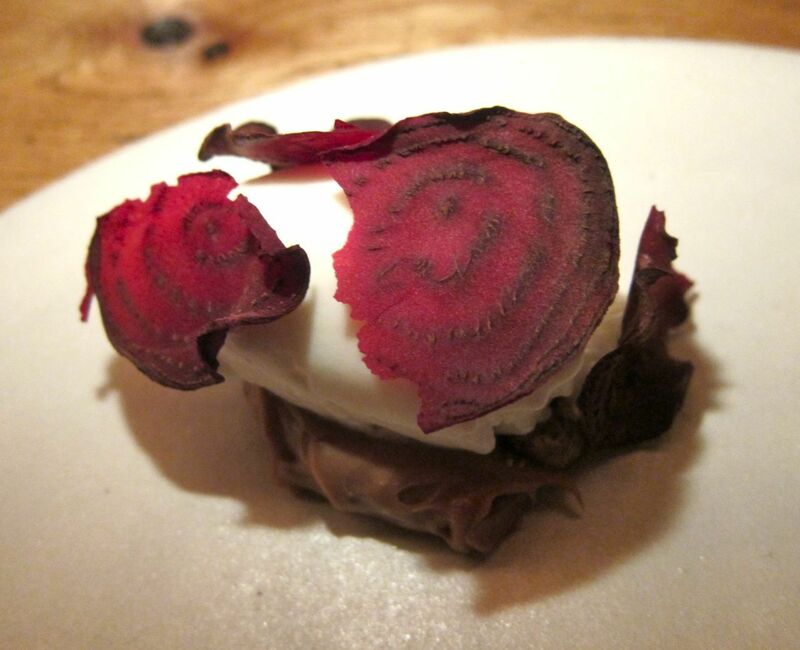 The insouciance of the waiter, the unlikely elements of the turnip and even the bread suggest that this is different. But it’s the monkfish that ignites my senses. A thick cut, precisely sculpted, stunningly fresh, exquisitely cooked -- not one minute too little, not half a minute too long. The salting of the fish seems unreal, as if the salt is contained in the fish’s DNA, not added. 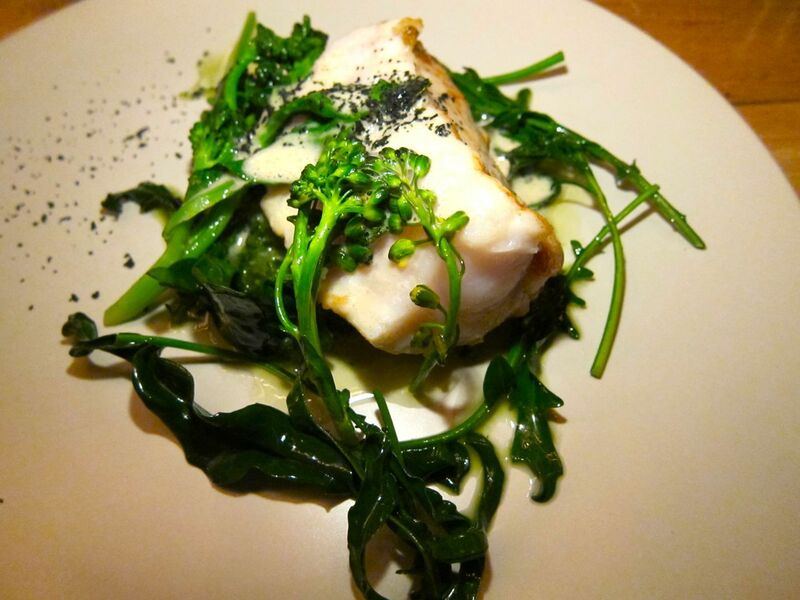 The balance of the fish’s sweetness against the bitterness of the broccoli (piracicaba broccoli from a farm in Queens) on a sauce infused with the fish’s skin and bones. The black specks are dehydrated and pulverized seaweed. I think of Gilbert Le Coze’s monkfish. There. Is that quite enough? "We have an extra optional course tonight,” the waiter announces as a busser belatedly clears. “It’s squab with caramelized onions. It will come after the beef. Would you like to order it?” Nico is eager. I order two portions for the three of us. 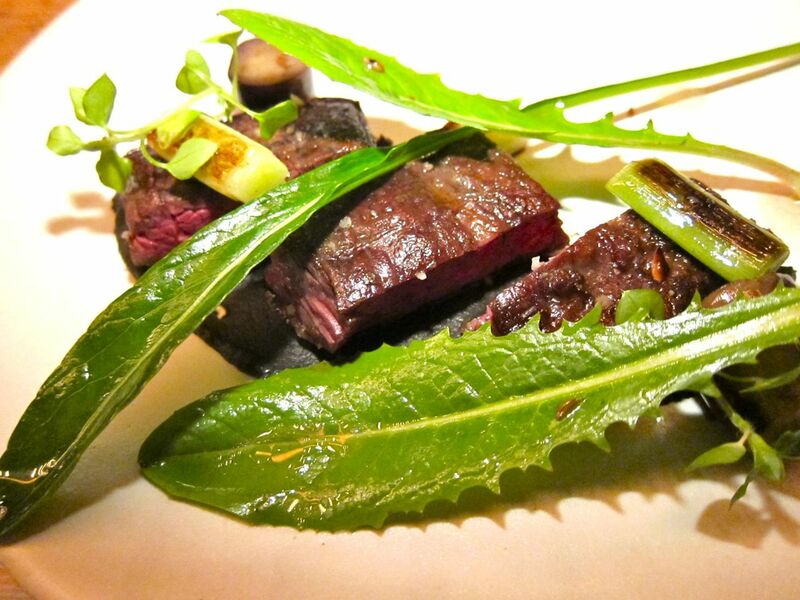 An odd little paring knife slices the lush and tender wagyu skirt steak like butter. The beef turns out to be wagyu skirt steak, lushly rich and thrillingly tender (cooked low and slow, Stone says), easy to cut with the odd little paring knife-like tool. It sits on a swath of pickled eggplant purée, roasted and charred, then seasoned with fish sauce and cumin, with cuts of leeks roasted on the plancha and dandelion leaves, and somewhere, bits of dried, shaved squid. 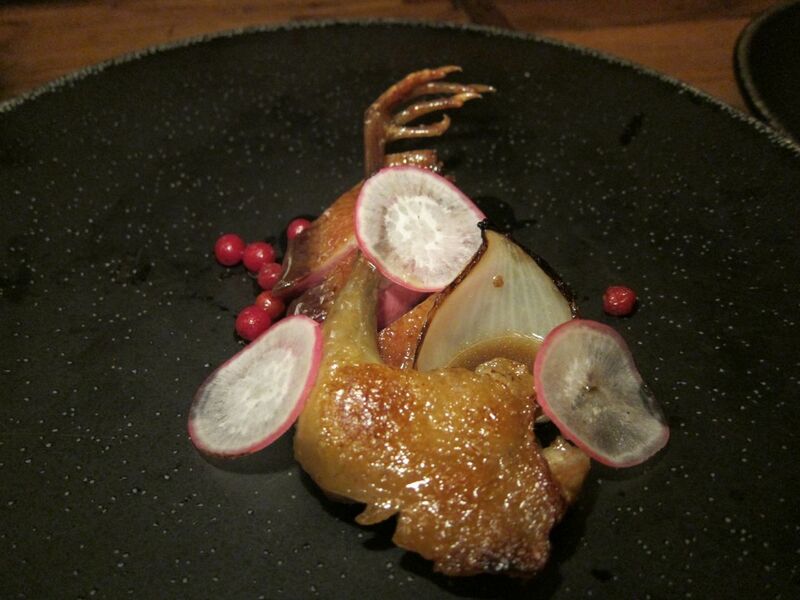 The squab is rich and rare too with salt-baked onions and tiny tart frost berries. After a longish pause, when I wonder if I can eat any more, two plates arrive and are set in the middle of the table: two half birds, rare as requested, a thick layer of fat under the skin. One twilight claw grasps its last. There are salt-baked onions and tiny red berries. “Frost berries,” says the waiter. More wonderful than cranberries, we agree. Google finds frost berries with healing power in the Parallel Kingdom. Ignore that. A tart, wild berry from an organic market, the partners found them in the green market. At some point I imagine the lights are dimmed. I become more aware of music. Alternative rock. Everyone on the staff chooses favorites. The first dessert arrives -- sweet and sticky and wonderfully delicious crumble of quince tea jelly, frozen sour cream parfait with olive oil cream and crushed cookies. Grafton’s naked cheese forms its own rind as it ages; served with Korean Moo radish. “Will anyone be having cheese?” the waiter asks. Nico will. 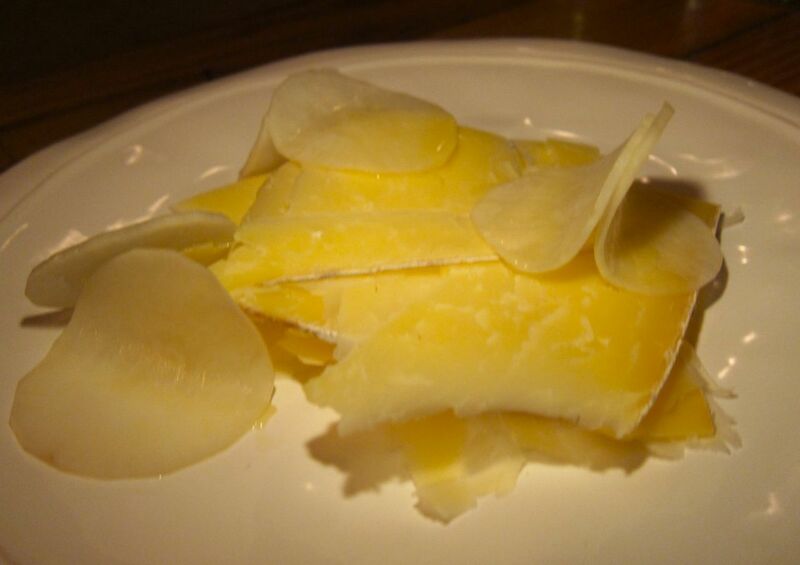 Shards of Grafton’s wonderful mellow naked cheddar come piled high with what look like rounds of recycled kohlrabi. But the kohlrabi turns out to be Korean radish, pickled or vinegared. Lauren and I taste the marvelous cheese. I would like bread or toast, a cracker or crisps, I say, but Nico, mellowed by life in Venice, California, pronounces it perfect as is. The second dessert – roasted and dehydrated beet thins on yogurt sorbet with a puddle of hazelnut crémeux – is a letdown. It’s more of a statement than a pleasure. “Who’s having tea?” asks the waiter. Dehydrated beets on yogurt sorbet with gianduja crémeux. “No one,” we respond. The bill is shocking at first. A masterly job of upselling. Our $55 tasting dinner has ballooned to $266 -- with $6 for bread, $30 for two portions of squab, $8 for cheese, plus three beers and a glass of wine. It seems rich for a modest dump on Orchard Street. But fair enough for the sensuous ride. I liked it better than Blanca at Roberta’s. I was happier by far than at Brooklyn Fare. It had the free spirit and even more brilliance than Le Restaurant at All Good Things. I’ll be back soon. 138 Orchard Street between Delancey and Rivington, 212 466 4633. Tuesday through Saturday from 6 pm to 11pm. Closed Sunday and Monday. Walk-ins welcome.